Our faculty are research specialists in African languages and the literatures and cultures expressed in those languages. Our students train in literary studies, critical applied linguistics, and cultural studies. Below are examples of what we’ve been working on during the current academic year. Past years can be found here. Nevine El Nossery writes, “In the wake of major events that have shaken the Middle East and North Africa since the Arab Springs, politically engaged women artists have increasingly come to characterize a key new direction in art production. I am currently working on a book manuscript tentatively entitled Archiving Defiance: Women, Art, and Revolution which tackles some compelling questions that have not been examined from a comparative and multidisciplinary perspective. How do women artists address, engage with and negotiate specific political issues and, according to them, how can art help foment social and cultural changes? How and why is the audience becoming more and more an active interlocutor in the process of creating art, rather than a mere spectator of a work of art? In which ways are the different forms of creativity generating transnational art? And most importantly, how archiving gendered politicized forms of creativity is an act of defiance in itself? My main contention in this study is that the Arab Uprisings constituted a powerful catalyst for women artists to enter the political realm and to develop new approaches to mobilizing knowledge and creativity, which they increasingly use as social tools to inform and shape institutions, politics, and culture. 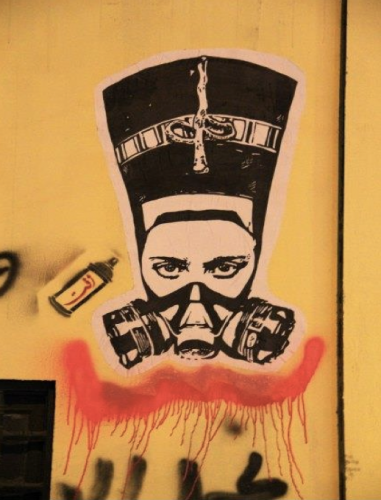 Considering myself as an archivist, the core focus of my book is to examine and archive some of the most representative creative productions from the MENA region that have been altered in their nature, form, and aims because of the Arab Unrests.” Pictured above left: Zeft, Nefertiti with a teargas mask. Samuel England’s book, Medieval Empires and the Culture of Competition, came out in November 2017. He has subsequently turned to researching his next book, which is planned as a study of Classical Arabic cultural products in modern dictatorships. Samuel’s shorter projects of 2017-18 include the article “An Ayyubid Renaissance: Saladin, from Knighthood to Nahḍa,” published in the journal Alif in Spring 2018. Working on that project gave Samuel the chance to map out some of his historiographic thoughts on modern fiction writers, especially playwrights, and their attempts to reanimate medieval royal figures like Saladin around the time of the First World War. The article also allowed him to collaborate with and learn from the issue editor, Mona Baker, who specializes in the discipline of translation studies. Samuel completed a short essay for a forthcoming edited volume on visual media, entitled Unwatchable (Rutgers University Press, late 2018). His study took as its subject the Egyptian television chef Muhammad Fawzi (pictured left), who unwittingly became a political pawn in the work of a Washington, DC think-tank. The research experience made Samuel wary of ever watching food television again, but the essay was one of the more enjoyable academic projects he’s done. Luis Madureira published two book chapters (and two additional book chapters and a peer-reviewed article forthcoming) on Lusophone African literature: “Adrift Between Neoliberalism and the Revolution: Cape Verde and the South Atlantic in Germano Almeida’s Eva,” in The Global South Atlantic (Fordham University Press: 2018), “No Telephone to Heaven: Post-Colonial Writing, the Pursuit of Freedom and Colonialism’s Genocidal Impulse,” in Post/Colonialism and the Pursuit of Freedom in the Black Atlantic (Routledge: 2018), “Chronicles from the ‘Vulture Kingdom’: The Post-Colonial State in Question in Ungulani Ba Ka Khosa’s Historical Fiction” (forthcoming in Research in African Literatures, spring 2019), “Lusophone Southern African Literature (Angola and Mozambique),” in A Companion to African Literatures (forthcoming in 2020 by Wiley), and “Eva das mil pessoas: Política e hiper-sexualide em Eva de Germano Almeida,” in Narrativas escritas e visuais da nação pós-colonial (forthcoming by Edições Colibri [Lisbon]). In addition, he has published a chapter on Mozambican theatre, “’Performing Like There’s No Tomorrow’: Theatre, War, and Social Precarity in Mozambique,” in State and Culture in Postcolonial Africa: Enchantings (Indiana University Press, 2017), and is currently working on a chapter on literary cannibalism in Brazilian literature and culture (forthcoming by Routledge). His essay on Mozambican theatre relates to a book-length project that centers on the complex ways in which Mozambican drama (ranging from the Marxist-Leninist republic to neoliberal, multiparty democracy) negotiates and re-articulates ethnic, class and gender identities both against and alongside dominant nationalist ideologies. The chapters on Lusophone African fiction intersect with a project which examines in depth several historical novels from Portuguese-speaking Africa and explores the entanglements inherent to the adoption of a classical European genre buttressed by the very notions of cultural difference, gendered subjectivity and teleological time that postcolonial reinterpretations of the past ostensibly seek to interrogate, if not undo. Ron Radano is presently completing the final stage of work on a comprehensive analysis of US black musical aesthetics, which situates the production of value in the relationship between race and capitalism. This research will be published as a monograph under the title, Secret Animation of Black Music: A Theory of Value. With his aesthetics project nearing completion, Radano has recently launched a new research initiative, which will focus on the recordings of African music produced by German colonial-era travelers during the first two decades of the twentieth century. A Berlin Prize fellowship for the spring term of 2019 will support his stay at the American Academy in Berlin, where he will begin extensive research, listening into the history of this seminal colonial archive of sound. Katrina Daly Thompson received a Vilas Associates Award for 2018-2020, which “recognizes new and on-going research of the highest quality and significance” and has also been selected for the Summer Humanities Research Fellowship, made available through the Institute for Research in the Humanities (IRH), which supports tenured humanities faculty in pursuing “the next big project” and seeks to inspire participants to think programmatically about their research as well as how effectively to pursue external funding to support their scholarship and advance their career. Both will enable her to continue work on her next book project, Progressive Muslims through Discourse. When she was first admitted to the University of Wisconsin- Madison, doctoral student Kathryn Mara received a Mellon Foundation Area and International Studies Fellowship for Incoming Graduate Students, which she intends to use in summer 2018, in order to undertake fieldwork for the purposes of her dissertation, tentatively titled “Memory Abroad: Narrative and Discursive Practices Surrounding the 1994 Genocide Against the Tutsi.” This summer, she will conduct participant observation and interviews with Rwandan communities in Montreal and Toronto. Next academic year, she intends to visit more groups of Rwandans in the United States, which has been made feasible by the receipt of a 2018-2019 Graduate School Fellowship. In addition to developing her own research, Kathryn has also grown as an advocate for research in the humanities more broadly, receiving funding from the Graduate School to attend the National Humanities Alliance Annual Meeting and Humanities Advocacy Day in Washington D.C.